Congratulations on your Graduation! Eurocom launches its #Grads2018 Upgradeable Laptop Program for all recent graduates from high school, college, university worldwide. To celebrate the great achievement of Graduation, Eurocom would like to congratulate each and every graduate by offering them a Golden Opportunity; the #GRADS2018 promotion. For the summer season (June 30 - August 31), all graduates, from middle school to high school to university; are eligible for an Exclusive Graduation discount. 20% off the amazing Tornado F5. This system was voted by our followers "the must have laptop this year"! In today’s job market simply having a university degree or college diploma isn’t enough. Intangible and soft skills can be what separates a candidate from the pack. Knowledge of how to use key tools will put any graduate above their competition. The Tornado F5 is a system with the character of classic laptops. Its production is largely a manual process performed by craftsmen that harnessed their skills through decades of experience. The result are systems that can withstand the hardships of daily usage and the test of time. The Tornado F5 has fully upgradeable modular GPU and socket based CPUs, it is the perfect storm of customization and power. Whether you want to be an architect, an engineer, or a developer (gaming or otherwise), the Tornado F5 can fit your needs. The most diverse system on the market, you can have GeForce or Quadro cards, a Xeon or i7 processor, and you can run Linux or Windows 7 or 10. Your laptop has never been faster with up to 64GB of DDR4 RAM. Mechanically, modern laptops are effectively sealed units with components that are on-board and unserviceable. Though cheaper in price, all these systems often limit users of an unfiltered computing experience. The Tornado F5 is fully upgradable. All of its parts are changeable, serviceable and easily upgraded to better and newer components at a fraction of the cost. Students using the Tornado F5 can expect a system that will make the transition from secondary to post-secondary school with ease. Giving them the peace of mind to focus on their studies, the upgradeability allows the system to grow as students’ progress through their education and into their professional life and work. 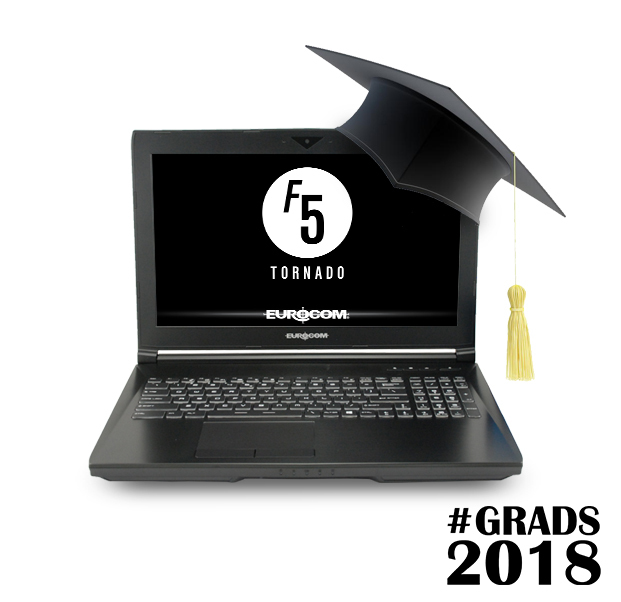 Conversely, the Tornado F5 can help a recent graduate of post-secondary education by giving them the knowledge of what it is like to work on cutting edge technology. The durability and expandability of this system provides grads with a solid foundation on which to build their career. The versatile Tornado F5 can adapt to any need simply with the change of a few peripherals. Configure with an i7 processor and a GeForce GTX 10 series GPU and you have a powerful gaming laptop. Turn it into a professional system with just the powerful i7 processor. Drop in a Xeon processor and turn your Tornado F5 into a Mobile Server for running server class apps or multiple VMs. Pair an Intel XEON processor with a NVIDIA's Quadro GPU and your EUROCOM Tornado F5 is the most powerful Mobile Workstation anywhere you go. No matter which operating system you use, the Tornado F5 can bring your work or play to the next level. All graduates using this promotion, must email sales@eurocom.com proof of graduation in the year 2018 after making their order. The proof can be an image of a diploma or transcripts from the school he/she graduated from. This promotion is open to all graduates from any level. Whether they’re from middle school, high school, college, university, all graduates can take part in this awesome promotion. The exclusive discount will appear in the billing document after the proof has been provided.